TRENDnet’s AC1900 High Power Dual Band Wireless USB Adapter, model TEW-809UB, upgrades a computer to Wireless AC1900. 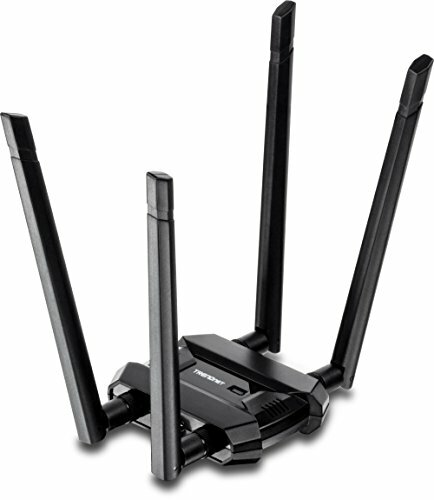 Quickly connect to a high performance Wireless AC network at 1300 Mbps or to a Wireless N network at 600 Mbps. A high power radio with detachable high gain antennas increase wireless coverage. Upgrade your computer to 1300 Mbps WiFi AC or 600 Mbps WiFi N to surf, game, and stream 4K HD video. Beamforming increases real-time performance by directing stronger wireless signals to each device's specific location. A high power radio with detachable antennas increase WiFi coverage.